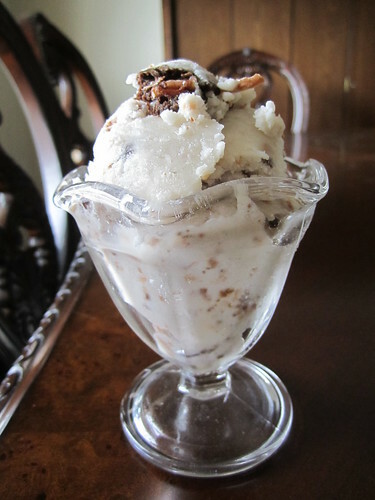 Toasted Coconut Brownie Ice Cream. Need I say more? There were a few days last week when it really felt like spring here in New Orleans. Dare I even say summer? All I know is that I saw a lot of shorts and sandals for a little while, which got me thinking of ice cream. Honestly, it doesn’t take much to get me thinking of ice cream. The day that I ended up making ice cream, however, ended up being the day when a cold front swept through, dumping tons of freezing rain on all of those people in their shorts and sandals. 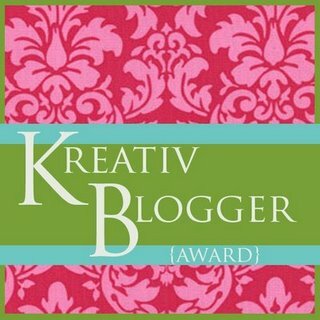 I chose to soldier on, ignoring the weather and rejoicing in my tiny amount of free time. 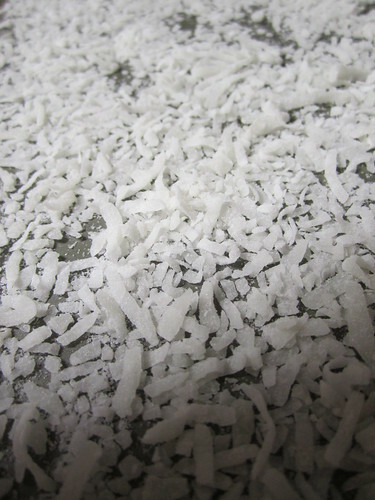 I ended up taking my own advice and toasting up some coconut to go into my coconut milk base. It was definitely the right way to go. 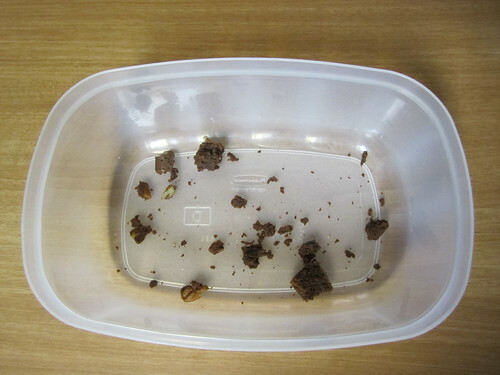 I had made some brownies (the always delicious Moosewood Fudge Brownies, this time without the chocolate chips and with pecans instead of walnuts because there were no walnuts to be found in my house) earlier that week, and the last two brownies were just sitting there on the counter, feeling lonely. What else could I do but chop them up and throw them in there? It was just the right thing to do. 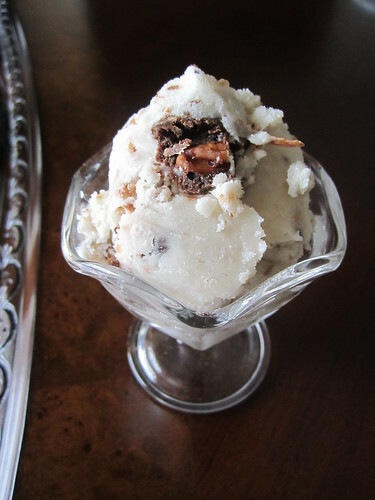 Toasted Coconut Brownie Ice Cream. I just couldn’t resist. Toast your coconut by spreading it in a thin layer on a baking sheet and putting it into a preheated 350 degree oven for 5-10 minutes. Be sure to watch it closely and stir it often, because it browns up really quick. I only needed 5 1/2 minutes. 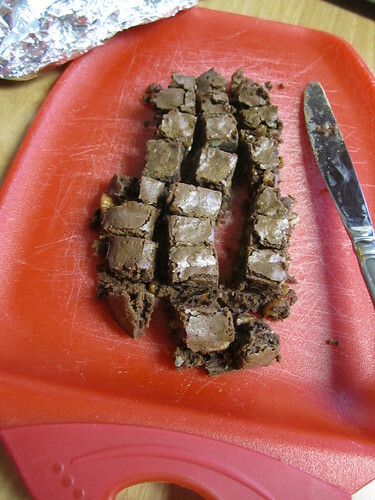 Chop up 2 of your brownies into little brownie cubes, and then leave the 1/2 brownie to the side for crumbling. 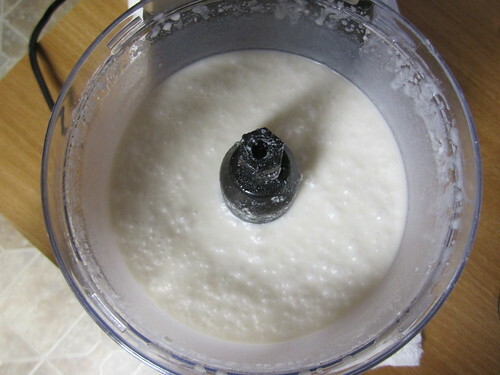 Dump your coconut milk (being sure to avoid spraying coconut milk all over yourself and the kitchen counter, like I did), sugar, and vanilla into a large food processor. Doesn’t that look a little bit like miso soup? It’s weird. Blend things up until they appear more presentable. 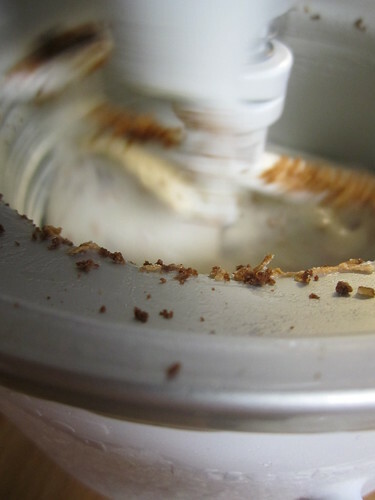 Pour your coconut milk base into your prepared ice cream maker and process according to the manufacturer’s recommendations. You’ll only have to process it for about 30-40 minutes total. 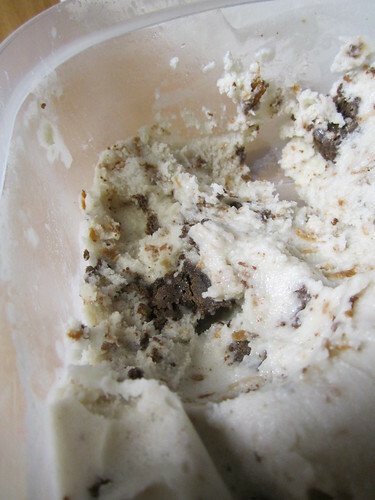 Add the toasted coconut and crumble up that remaining 1/2 brownie piece into the ice cream base when you only have 10-15 minutes left to go on the processing so that they are well-distributed. 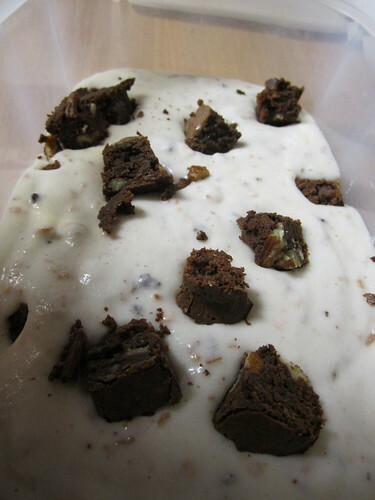 While you’re waiting for the rest of the spinning time, put some brownie cubes in your waiting ice cream container. 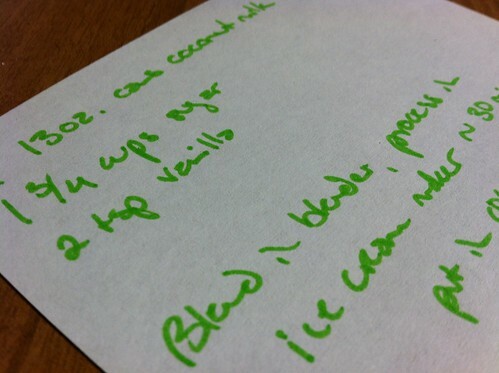 This is how Jeni makes her delicious chunky ice creams, so we are taking a page from her. She is a genius. When the ice cream is done spinning up, pour a little bit over those brownie pieces, and then put some more brownies on top. Until there’s no more brownies or ice cream. 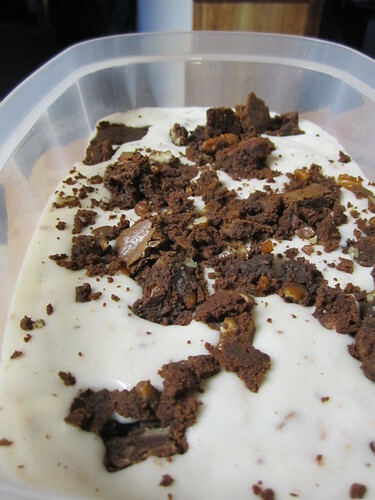 I made sure to cover the entire thing with a layer of the coconut ice cream base so that the brownies were totally submerged, just to avoid those brownie chunks drying out. 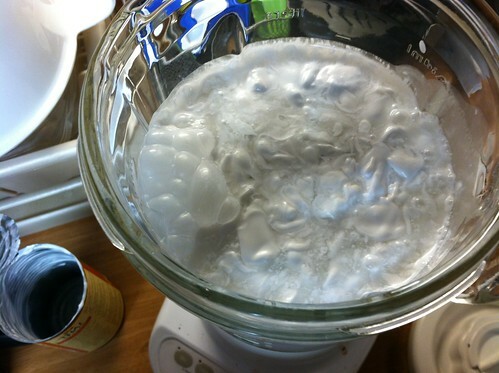 Cover the top of the ice cream with a piece of parchment paper and then put on that airtight lid. 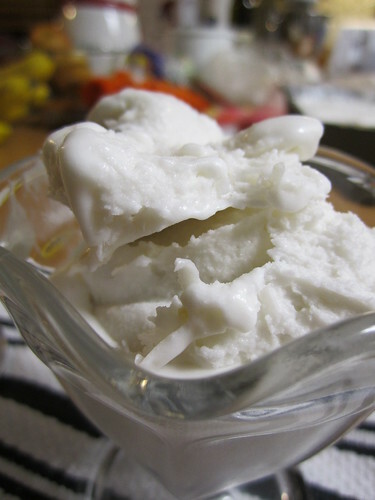 Allow the ice cream to freeze for at least 8 hours, but overnight is best. We did end up trying some that night, after 8 hours of freezing, and there was still a bit of graininess to the texture. However, this had completely disappeared by the next day. It’s definitely worth the wait. The sweetest of the coconut and the richness of the brownies and pecans work really well together, I believe. Dan declared this the best ice cream I’ve made so far. That’s saying something. Now if only the weather would cooperate. At my work recently, we had a summer potluck situation to celebrate our Summer Reading Kickoff, and instead of baking something easy like cookies or banana bread, I chose to delve myself deeper into my new ice cream maker obsession. 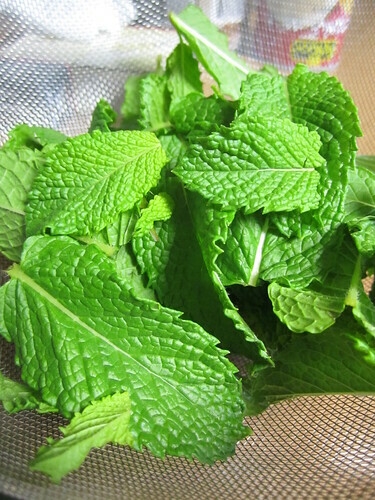 I started with some sprigs of mint from our backyard garden, not really having much else in mind than minty summer goodness. 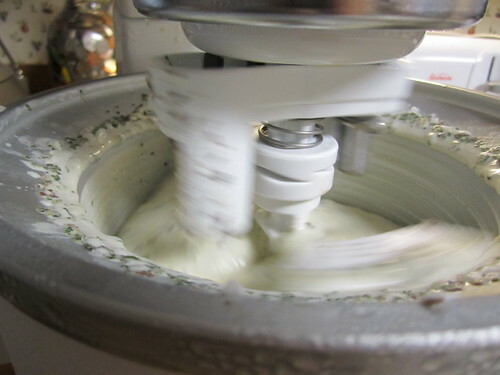 Those beautiful green leaves got all blended up in the food processor with the delicious coconut milk vegan ice cream base from the Hungry Mouse‘s fabulous recipe, yet again. I might be addicted to this stuff, guys. 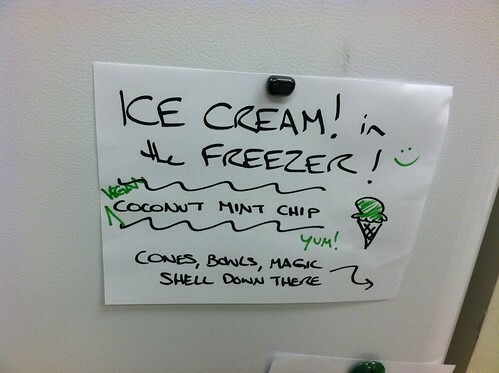 Things got to mixing, and it became clear that just mint alone wasn’t enough to kick off the summer with my coworkers. 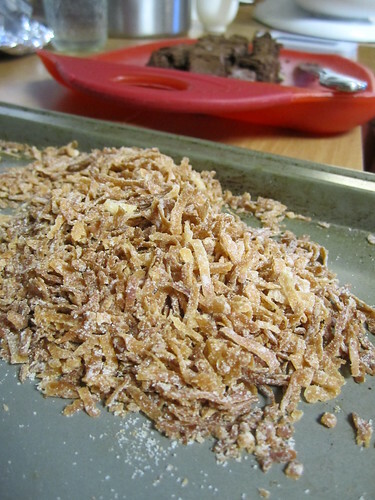 Chocolate and shredded coconut got involved, too. I meant to get some pictures of the finished product right out of the freezer, but in the bustle of the day, I’m lucky I got to it before it all disappeared. 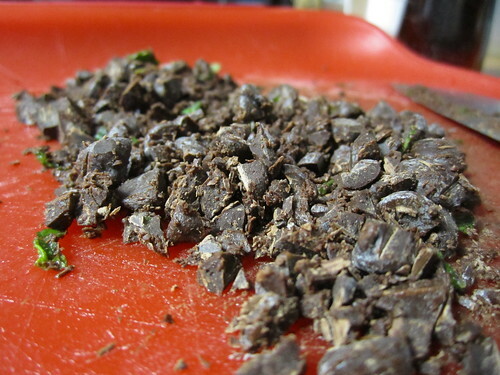 Look at all of those little flecks of fresh mint and chocolate! Yum! I brought magic shell and two types of cones to make a little ice cream bar, but most people just went for plain scoops. 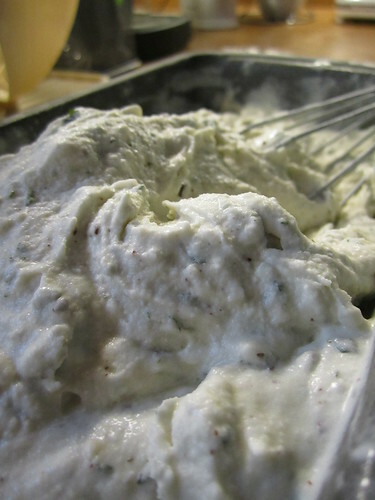 I feel silly saying it, but hearing how much people liked it and how surprised they were to taste fresh mint in homemade ice cream was just a fantastic feeling. 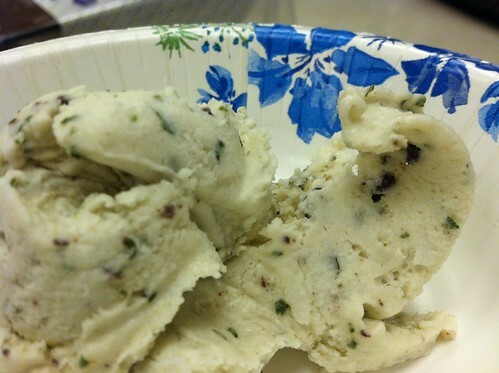 One of my more eloquent coworkers, A.J., declared that my ice cream tasted just like Christmas trees. He tried to explain it to me, but there was no explanation necessary, really. I totally get it. It’s fresh and bright and minty, with a little bit of the almost-bitter-but-not-really oiliness that makes me think of rosemary and basil in the best ways possible. The chocolate is dark, the coconut is chewy, and the whole thing coming together in such a lovely way was a wonderful surprise. 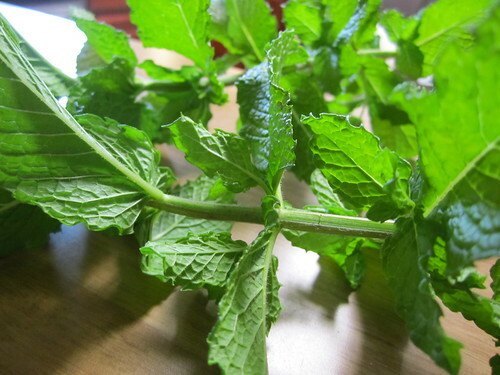 Strip mint sprigs of their leaves and wash well. 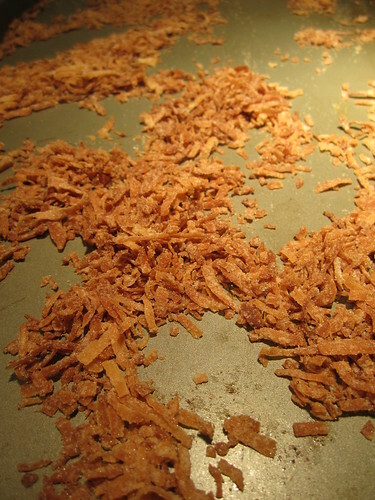 Put leaves in food processor and chop until leaves are finely shredded and are releasing their oil. 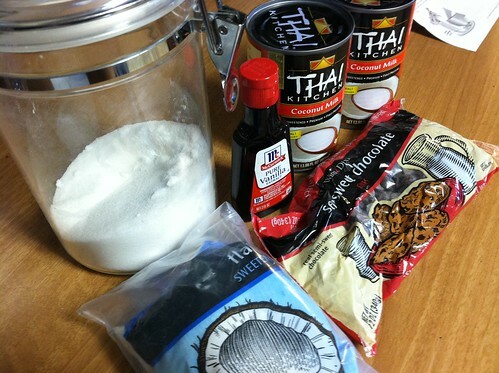 Add the coconut milk, sugar, and vanilla, and blend everything together until all ingredients are well-incorporated. 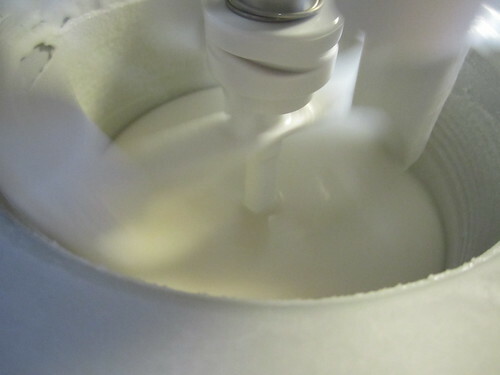 Pour ice cream base into prepared ice cream maker and process according to manufacturer’s recommendations. 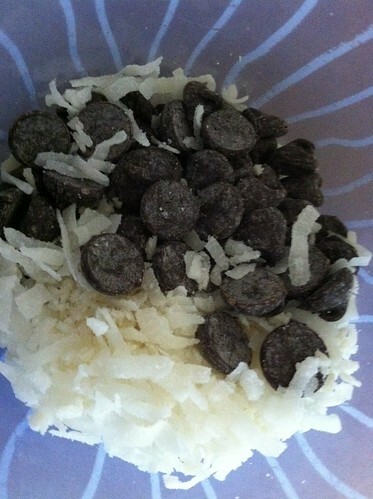 Add the chopped chocolate chips and coconut during the last 10-15 minutes of processing, after the ice cream has begun to thicken. 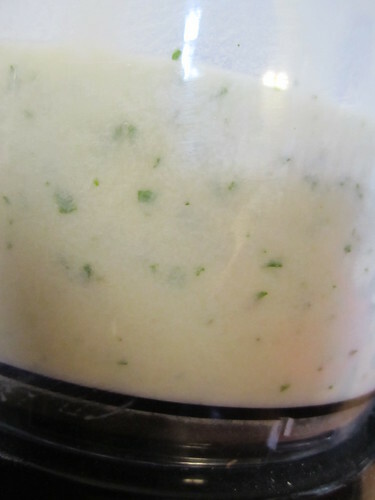 With the oil in the fresh mint, the one took a little longer than expected to set up, with the base processing for about 40 minutes by itself before I added the mix-ins. Your mileage may vary. 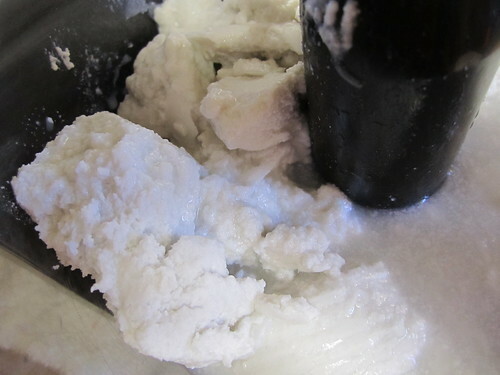 Pour the finished product into a freezer-safe container and cover the surface with plastic wrap to prevent a weird freezer-burny skin from forming. 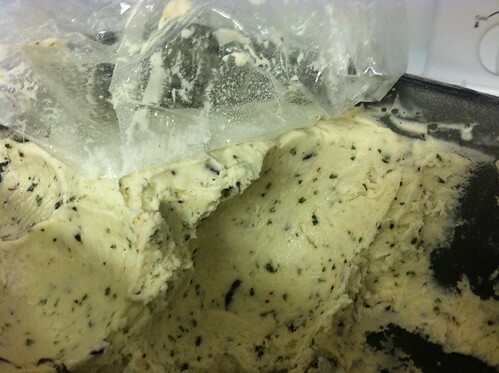 Allow the ice cream to freeze for at least 8 hours, but overnight is best. Then scoop it up and enjoy! 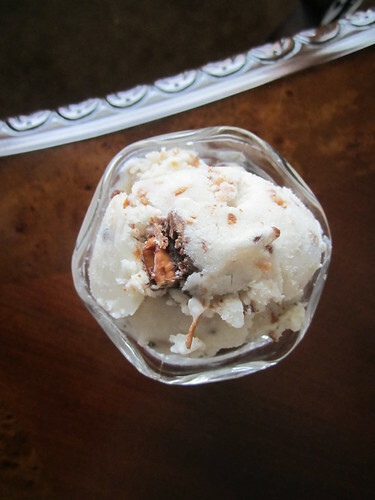 Coconut Chocolate Chip Ice Cream Will Make Your Life Better, Guaranteed. Sometimes you long for something for no good reason other than it would seriously up the awesome quotient of your life. Others don’t necessarily share your rampant desire, and they don’t have to, because you are a person on a mission. A person who needs to own an ice cream maker. A person who seriously needs to get someone else to purchase said ice cream maker because part of the fun of the chase is getting other people to participate unwillingly in this dream. Plus, who has so many dollars that they can just throw at one more piece of kitchen equipment that only does one thing? Not this person. Nope. That needs to be something that you mention casually to every person you know every single time you see one in a store or a catalog or on an awesome food blog and say just how much better your life would be with the possibility of homemade ice cream just around the corner every second of the day. Well, ladies and gentlemen…dreams do come true. Dan bought me the ice cream maker attachment to my KitchenAid mixer (another fantasy kitchen item acquired through extremely subtle…whining) for our anniversary last week, and we set sail on maiden voyage of homemade ice cream by fixing up some coconut chocolate chip ice cream. Wait…let’s capitalize that up and give it the gravity it deserves. 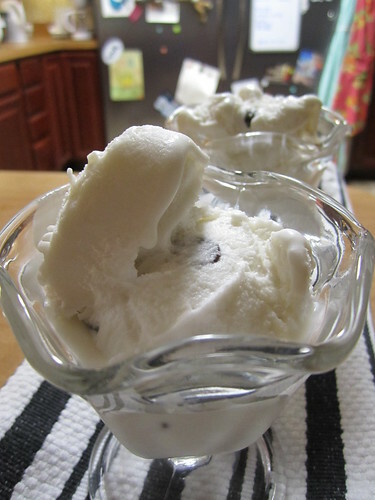 Coconut Chocolate Chip Ice Cream. Made by yours truly. 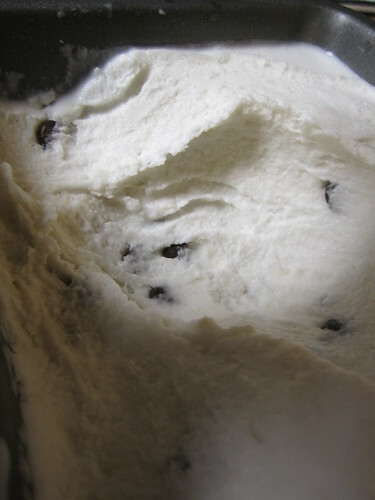 A little research yielded up The Hungry Mouse‘s amazing 3-Ingredient Coconut Ice Cream, which is creamy and delicious, and vegan, of all things! Coconut milk, sugar, and vanilla are all you need to get started here. 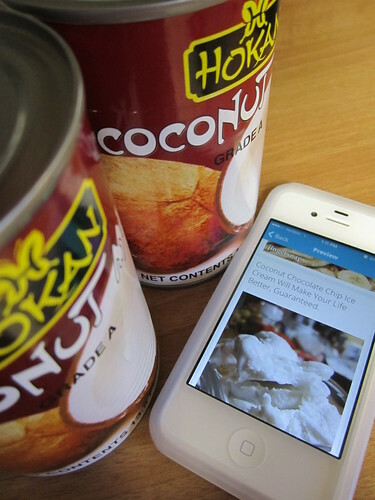 Now, coconut milk straight out of the can is pretty disgusting. You just have to get past that part and blend, blend, blend. 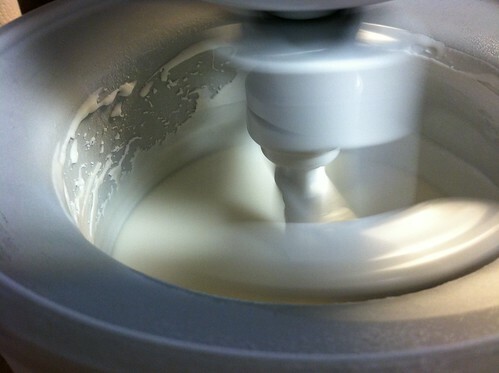 Then you pour it into your awesome new ice cream maker contraption and…just stand there staring. At least that’s what I did. For about 20 minutes straight. Because making ice cream is just slow enough to be both simultaneously extremely boring and immensely engrossing. It’s science! It’s colloids and emulsification and suspensions and chocolate chips. And coconut. 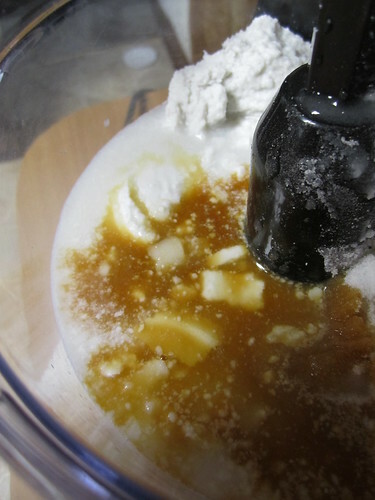 I added a half cup of semisweet chocolate chips and a half cup of sweetened shredded coconut to the recipe near the end of the mixing process. I should have put more chocolate chips in there. You could always use more chocolate chips. Also, toasting up that coconut is another great idea that I didn’t have the patience for at the time. You should do that. 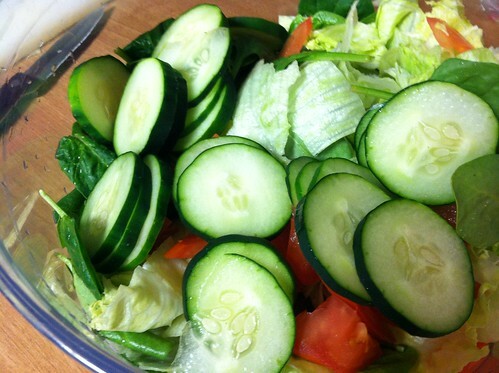 True to form, I also made a salad while the mixing was occurring. I used my overly-educated nursing school brain and figured green salad for lunch cancels out ice cream fatty goodness for dessert, right? So much science up in this place, it’s scary, isn’t it? And you guys, it was everything I hoped it would be. Awesomeness quotient went up by at least 20 points, by conservative estimates. It was sweet and nutty and creamy and freaking delicious. We couldn’t even wait for it to freeze all the way through, because it was singing its siren song from the freezer, and we were antsy. (And letting it go overnight was just not an option, am I right? That’s just ridiculous.) Also, letting it finish freezing, like you’re supposed to? Makes things even better the next day. And the day after that. And every other day of your life ever. I think that our summer is going to be full of plenty more frozen treats, and we may collectively gain a bazillion pounds. What do we try next? Italian ice? Gelato? A fancy fruit sorbet of some kind? I seriously need some guidance because my brain may explode from all the possibilities. Lend me your guidance, ice cream fans of the internet. Our summer depends on you!